There is always a simple solution for every difficult question! Don't you agree? This is also true of coming up with customized bullet journal layouts. 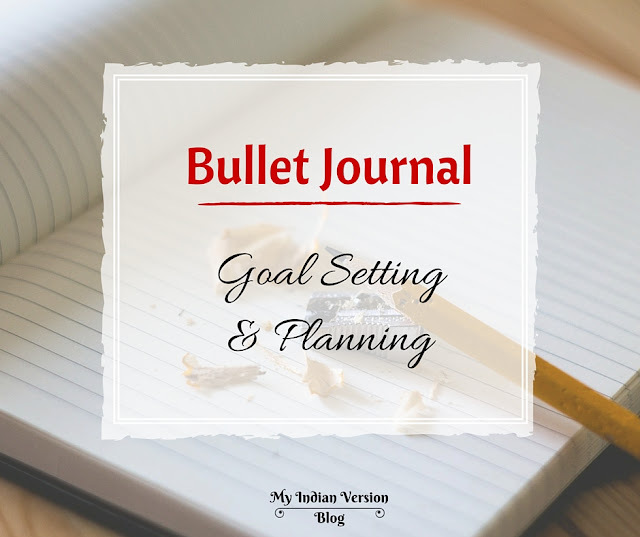 While using a Bullet Journal, one of the problems I came up with was to manage recurring tasks. Whether they occur weekly or monthly, I tend to miss them sometimes. 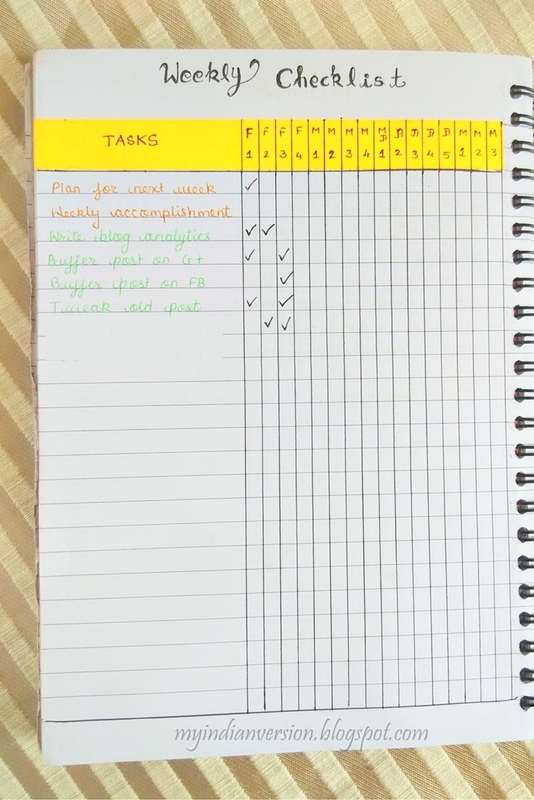 So here is my solution for writing, remembering, and tracking repeated tasks of every week and month. 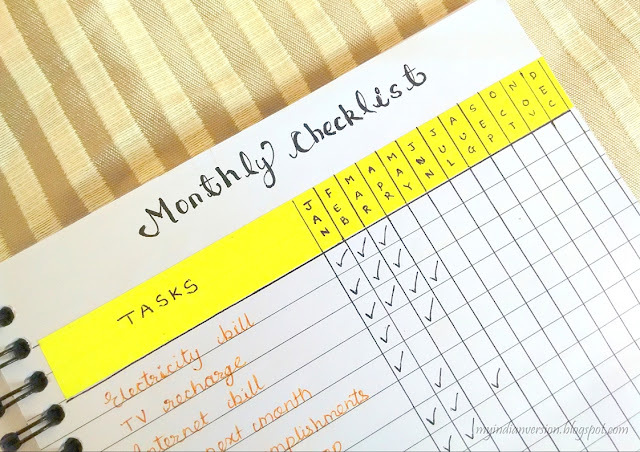 We all have tasks that recur every week or every month. Like bill payments, calling up for work, scheduling tasks, buying groceries, and so on. They range from personal to work. Remembering all these recurring tasks is quite a task in itself. And managing them can seem quite big job too. But it doesn’t have to be with this system. This is how you can handle them in better way. 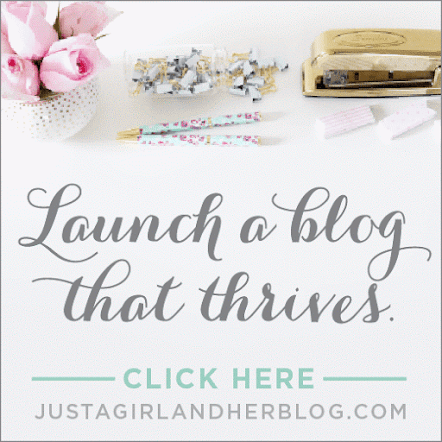 The very first step is to brainstorm all the weekly and monthly recurring tasks you have, and write them all down on one page. 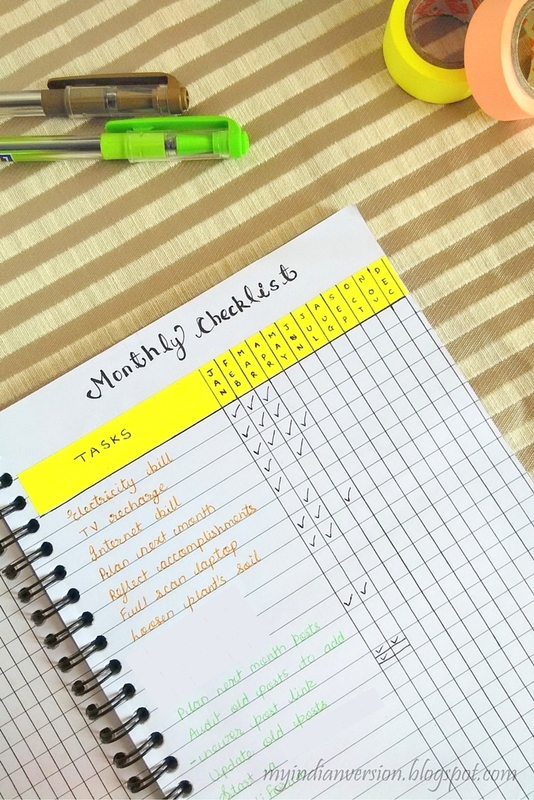 Then, make a separate checklist for weekly tasks and monthly tasks. Now it's time to create two Task Trackers, one for your weekly checklist, and the other for your monthly checklist. This page is divided into two parts - “Tasks” and “Weeks”. The to-do list of tasks sits on left-hand side. The right-hand side is for columns of each week of the month. You can see that I have named these columns with month's initial and that month's week number. In the below picture the weeks range from February, week 1, to May, week 3. 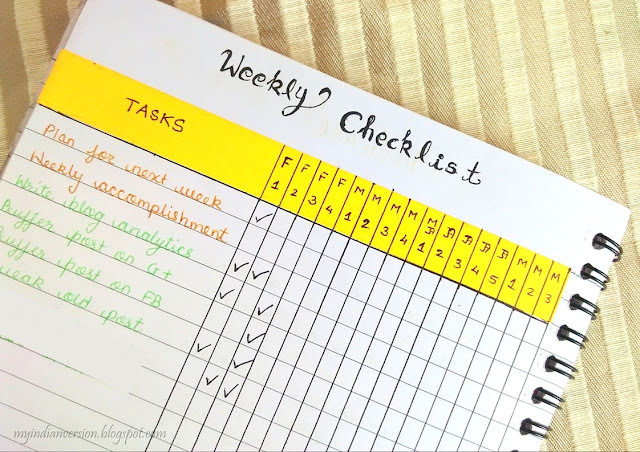 Once these weeks are checked, the tasks will be shifted to new page, continuing from May, week 4, to (approximately) September, week 4. And then the process continues until December. You could name the week columns from week 1 to week 52, but since I find that confusing I follow the month’s initial and week number naming style. I have also color-coded tasks as orange for Personal and green for Blog. When any task is completed I just place a checkmark in the corresponding box. Yes, I wasn’t so consistent in the first few weeks, but now everything is falling into place! 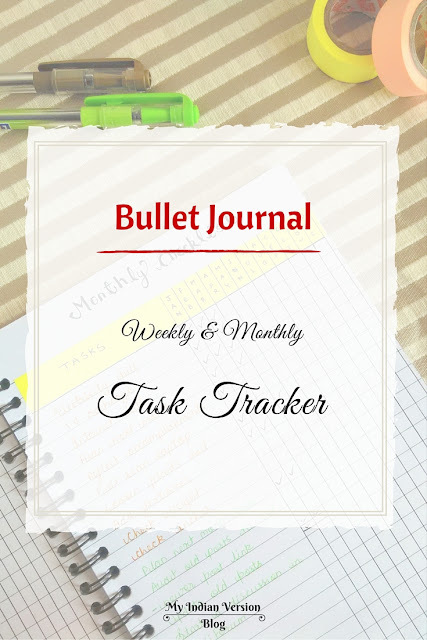 Similar to the weekly checklist, the monthly task tracker also has two parts - “Tasks” and “Months”. 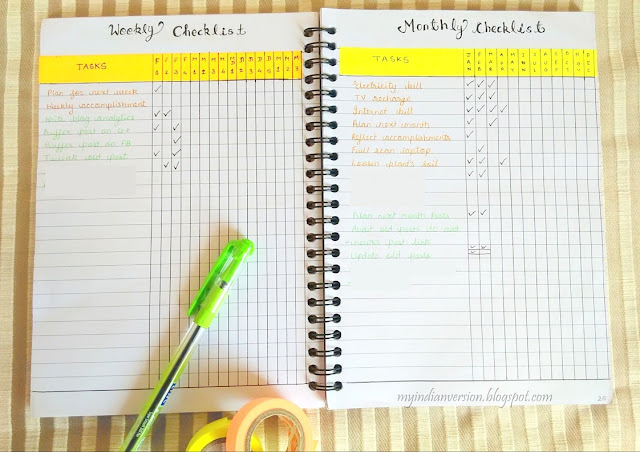 Every month's recurring tasks are listed on left-hand side and as they are completed, a checkmark follows for that month. Now, take a close look at last task, where one check box is further divided into three parts. Since I wanted to repeat the task three times per month, I just divided that tasks's checkbox into three parts. Simple, isn't it? If any task recurs four or five times a month, then it can go directly into the weekly task tracker. 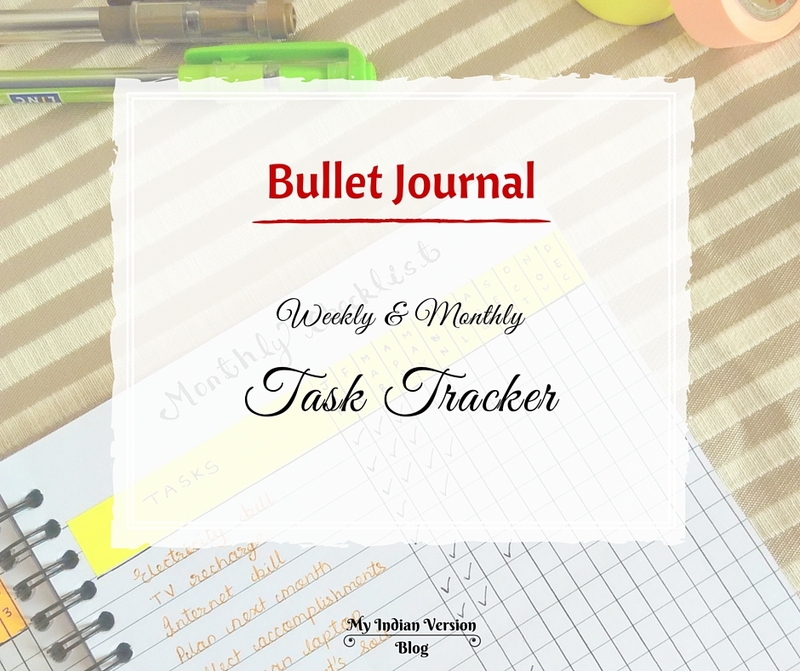 There is no need to add it into monthly task tracker. 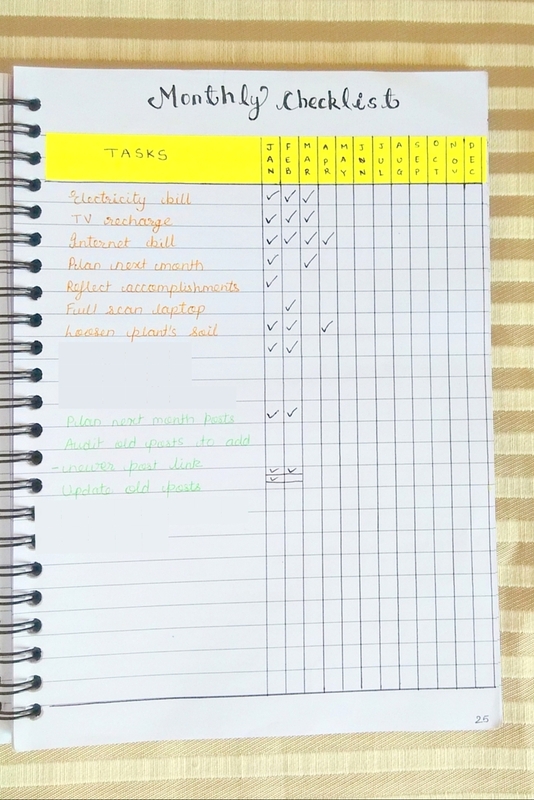 The monthly task tracker is not only a way to track down recurring tasks, but also to summarise a month or year at a glance. If you use a binder to plan your year then find the Monthly Task Tracker free printable with a free day planner printable too! Every time I plan an upcoming week, I just take a look at my weekly checklist and add the tasks to a particular day. And planning the first week of any month I also look at my monthly task tracker and pre-schedule the monthly tasks accordingly. What is your way of handling recurring tasks? Is it similar to mine? Tell me here or toss a reply on my social media accounts. Great post! This is one of the things I was worried about, since I just switched to using a Bullet Journal. I am glad you found it useful, Adam. Thank you, Shweta S! This is very helpful! I am glad the post was helpful to you, Maria!! I was looking for a decent post on recurring tasks, and you gave me the answers I was looking for. Thanks!!! I'm so happy these ideas helped you, Pedro! 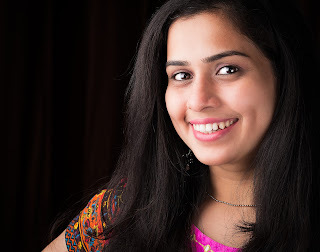 IndiBlogger Meet and My Dream Come True Moment!